We started our day with a two-hour hike on top of the ancient walls around the old city of York. Built in the 13th century, the walls closely follow the line of the walls built by the Romans in the first century. Views from the highest parts of the walls provide unique glimpses of old buildings and beautiful gardens. 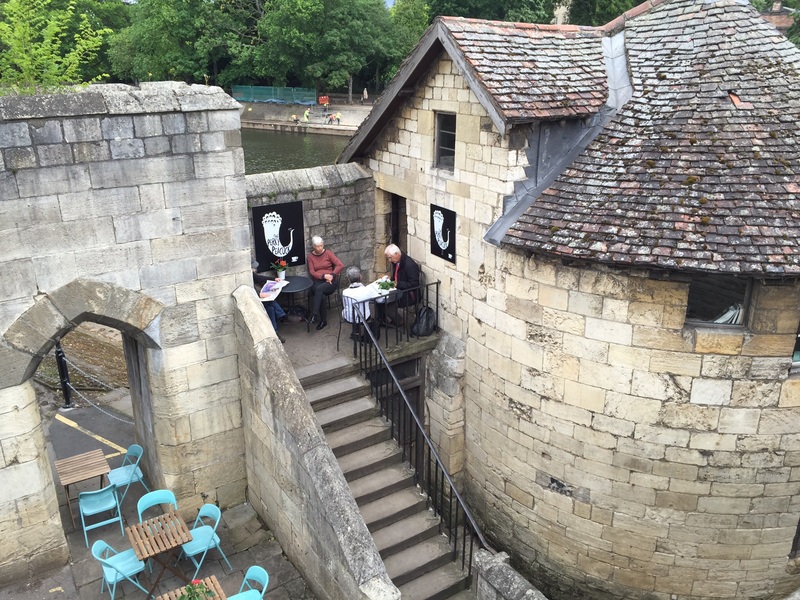 The tower gates now house coffee shops and museums. 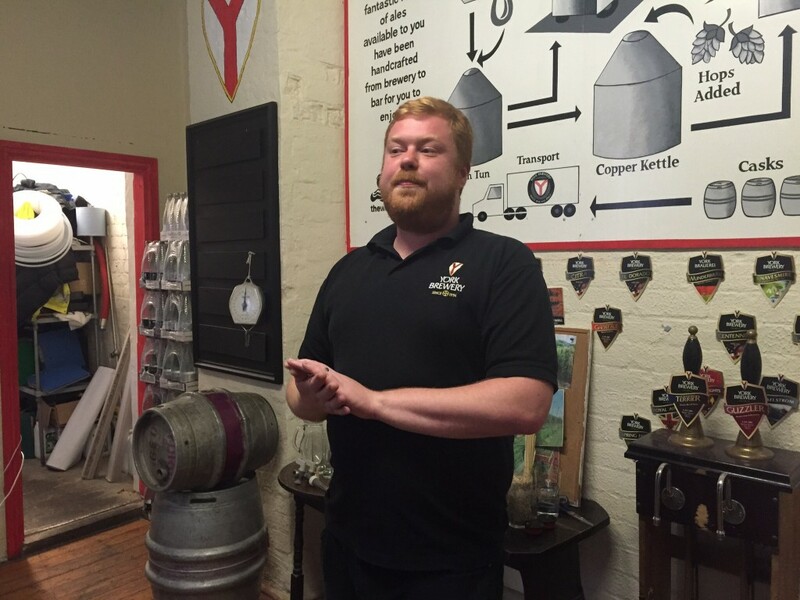 Our next stop was the York Brewery for a tour and beer tasting where our guide, Gordon, gave us a wonderful tour. 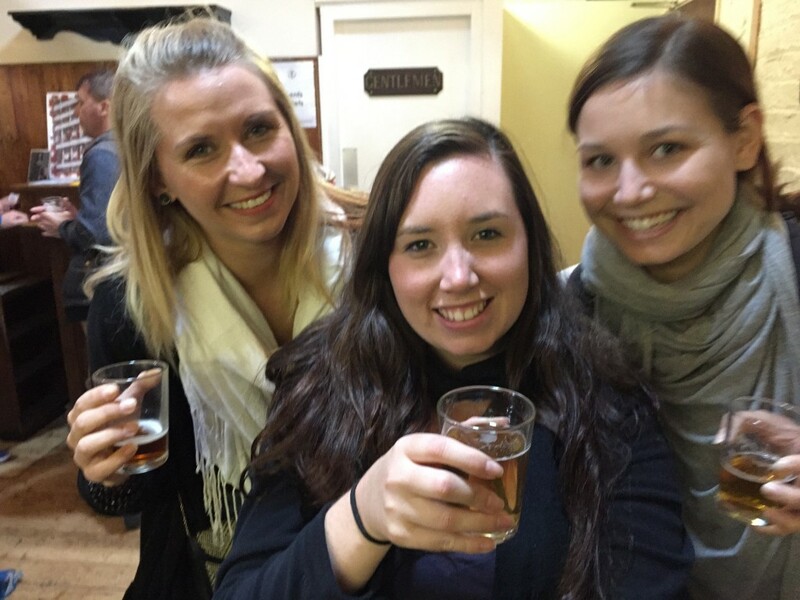 We had a great time in the tasting room after the tour, sampling the different beers and talking with other people on our tour. One thing we love about traveling is meeting locals and people from other countries. We talked with two men from York, a family from Bulgaria and three young women from Australia and Estonia who are on a six-month tour of Europe and the US. The Australian women didn’t really like beer, so they gave us their unused beer tokens. We had such a good time tasting and talking that we were the last ones from the tour to leave the tasting room. 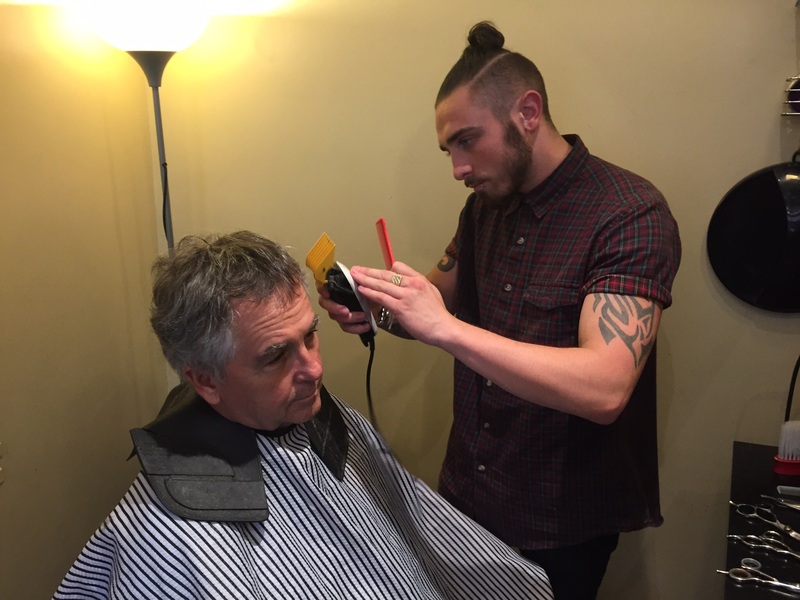 Paul wanted a trim, so we found a barbershop, and he got a proper British haircut. 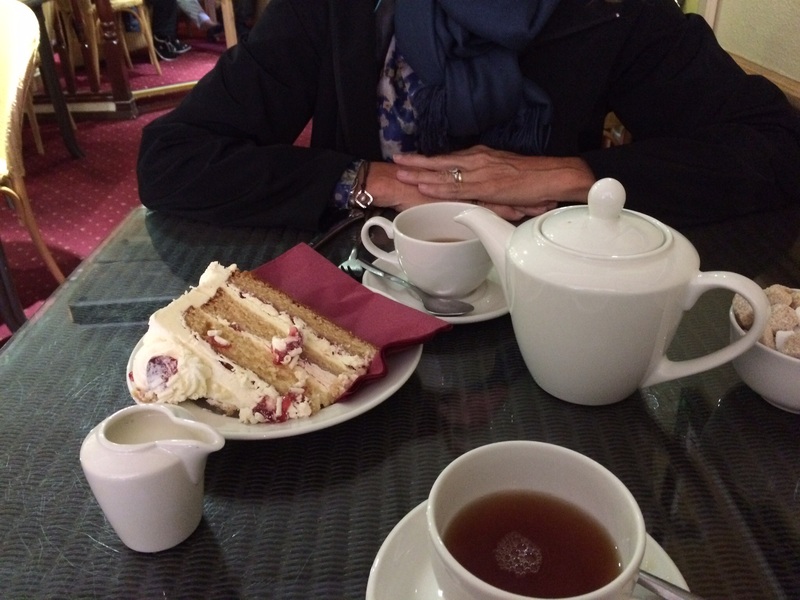 After a light lunch and a little shopping, we stopped for afternoon tea and a slice of Victoria Gateau. I never realized how well tea and cake go together. 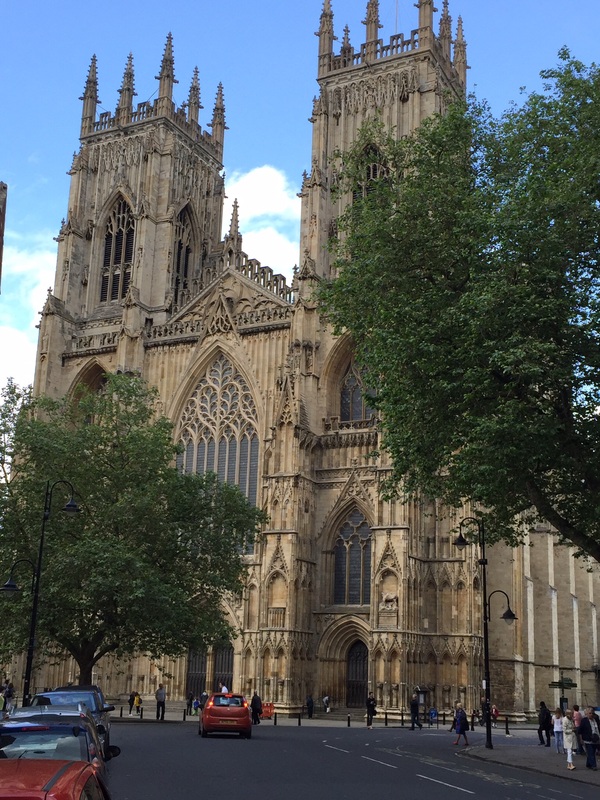 Paul returned to the hotel to do some work, and I attended the Evensong services at the Minster, one of the largest Gothic churches in Europe. A lovely couple next to me made sure I had a kneeling bench and served as my guides for when to sit, stand or kneel. This entry was posted in Great Britain 2015 on July 9, 2015 by debbie. Leaving London today, we thought how lucky we were that the expected Tube workers’ 24-hour strike wasn’t starting until tomorrow. We used the Tube many times each day, and our London experience would have been very different if we hadn’t been able to use the wonderful London underground system. But today we were traveling to York via taxi and train, so all was well. Our York hotel was a half mile from the train station so we walked the narrow sidewalks to our hotel, pulling two roller bags and Paul’s very-large golf bag. About two blocks from the train station light drizzle turned into heavy rain and we took refuge in a bus shelter. Lucky for us the rain soon stopped, the sun came out and we finished our hike to the hotel. After settling in to our room, we headed out for a little tour of our neighborhood. 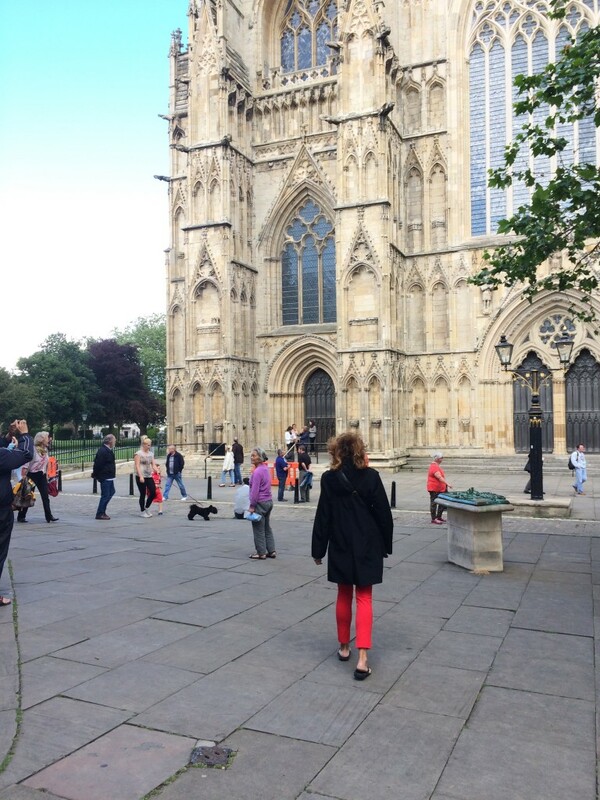 York is charming-narrow streets, quaint shops, very old buildings, wonderful restaurants and lots of places to get sweet treats. They love their chocolate, pastries and ice cream here. 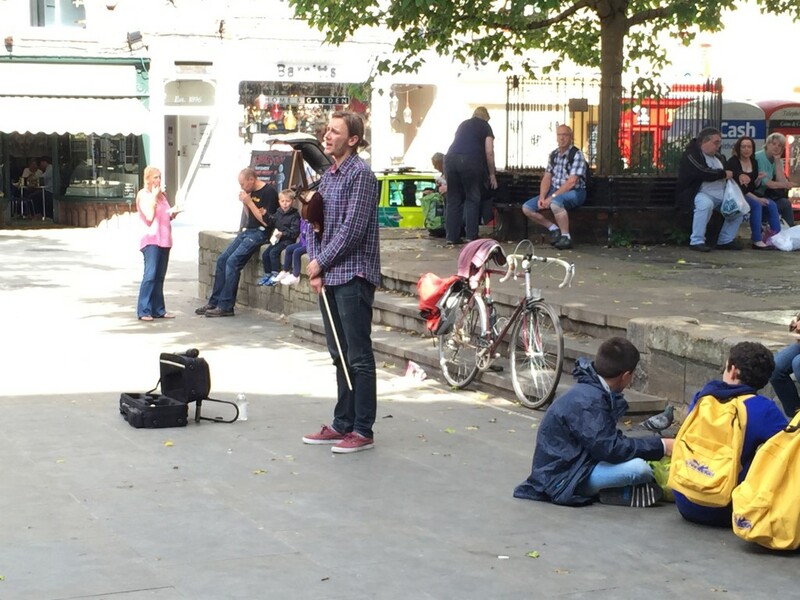 We love listening to street musicians and were delighted to encounter a young man playing the violin and singing wonderful English songs like Danny Boy. After a great meal at a little French cafe, we took a guided walking tour by a local who must have been a history teacher. He seemed to enjoy sharing some of the grizzlier aspects of York’s long and interesting history. 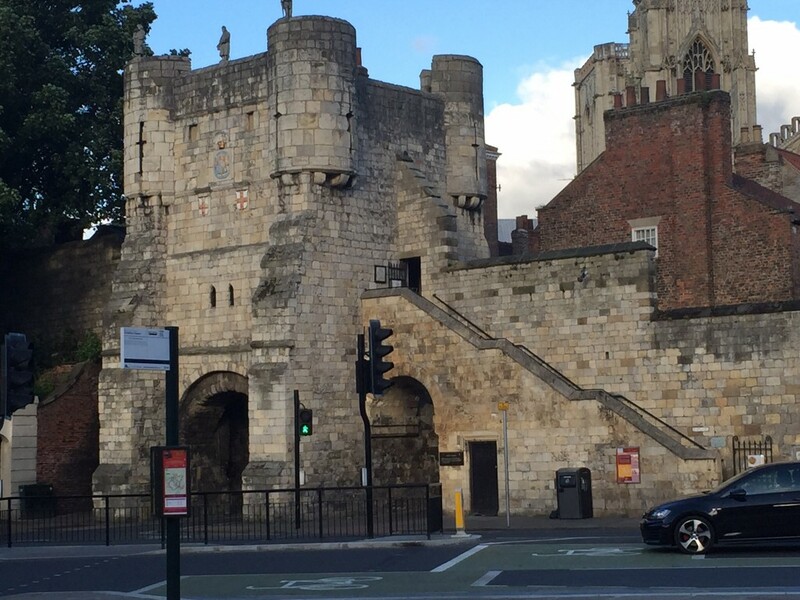 For example, we learned that Bootham Bar (a bar is a gate), an entrance to the medieval city, is where the Romans would display body parts of people who had been hung as a reminder that crime doesn’t pay. This entry was posted in Great Britain 2015 on July 7, 2015 by debbie. Today started with a big history lesson. We toured the Churchill War Rooms, an amazing exhibit of the original underground rooms that Churchill and his government used during World War II. Located under the Treasury building, they were used from 1939 until August, 1945 after the surrender of Japan. 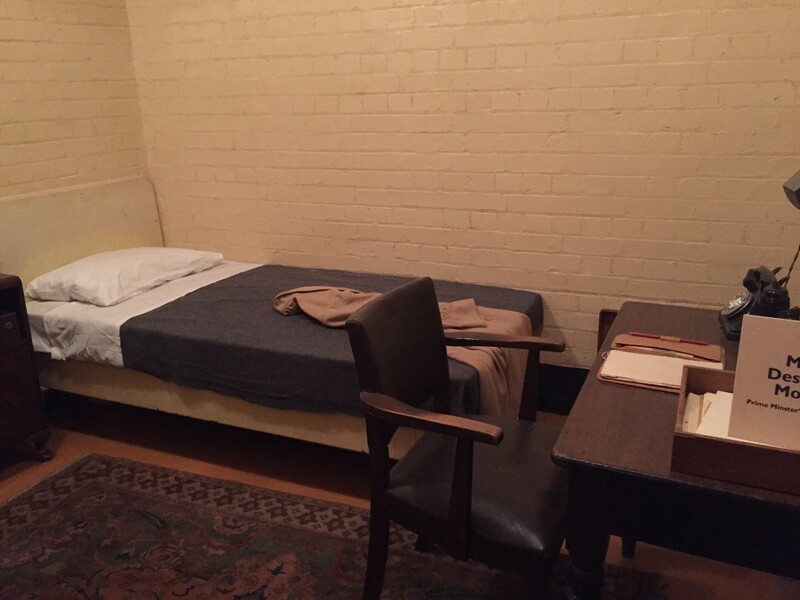 The rooms were maintained exactly as they were during their use. There also was an exellent museum depicting Churchill’s life. For a total change of pace we took the Tube to Jubilee Park at Canary Wharf to see a lunchtime concert by The Kansas Smitty’s Big Four as part of the City of London Festival. Canary Wharf is on a peninsula on the Thames and Jubilee Park is a lovely oasis in the midst of shining skyscrapers. 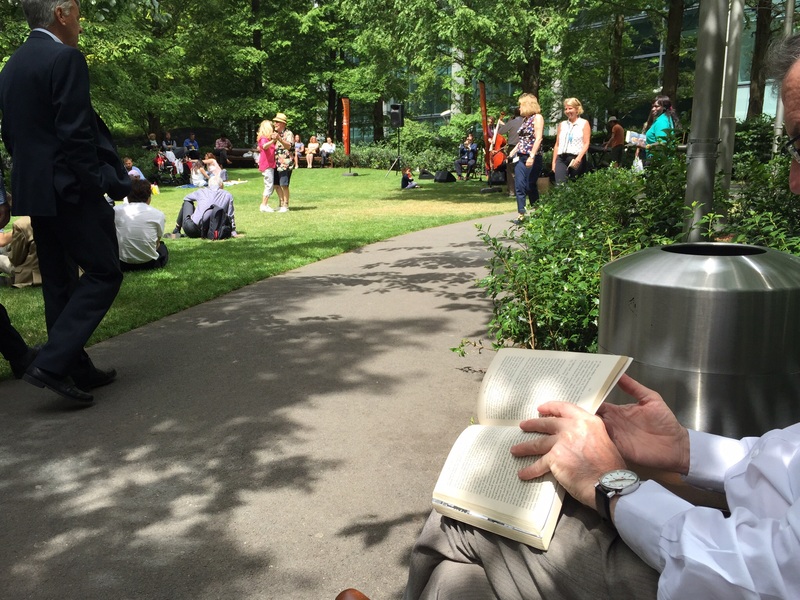 We sat on a little wooden bench and enjoyed listening to the music and watching the Londoners around us-beautifully dressed professionals on their lunch breaks, little children playing and an uninhibited couple dancing on the lawn. It was such a nice break from the London attractions. We ate a late lunch at Nandos, a Portugese and South African restaurant, recommended by a friend who lived in South Africa for a number of years. 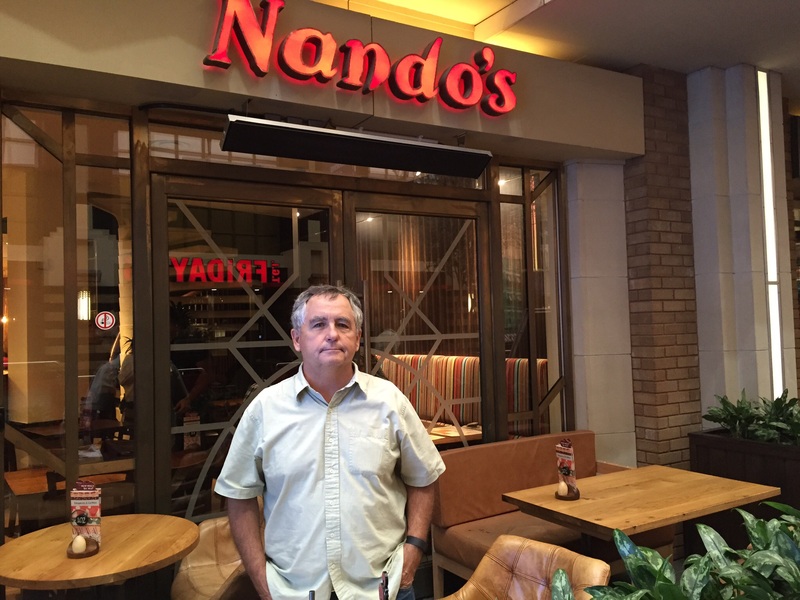 It is his favorite restaurant when he is in London and South Africa and he said we had to try it. 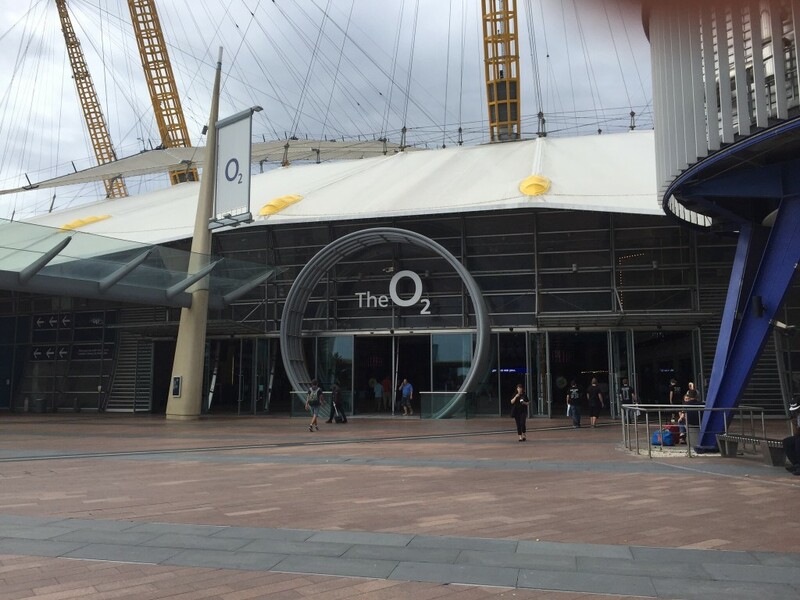 While scouting out the Nando’s location we discovered the o2, sometimes called the North Greenwich Arena. The site of the 2012 Summer Olympics, it is also the world’s busiest music arena. We had to come home a take a little nap before heading out for a play and dinner, but we didn’t feel too guilty after learning that Churchill loved his naps. After a little rest, we went to see Memphis, one of the best productions I have ever seen and had a late-night snack of dim sum. Tomorrow we bid London a fond farewell and take a train to York. This entry was posted in Great Britain 2015 on July 6, 2015 by debbie. We covered a lot of ground today-three Tube trips and ten miles of walking. Our first stop was Notting Hill where we explored the Portebello market and wandered the neighborhood. 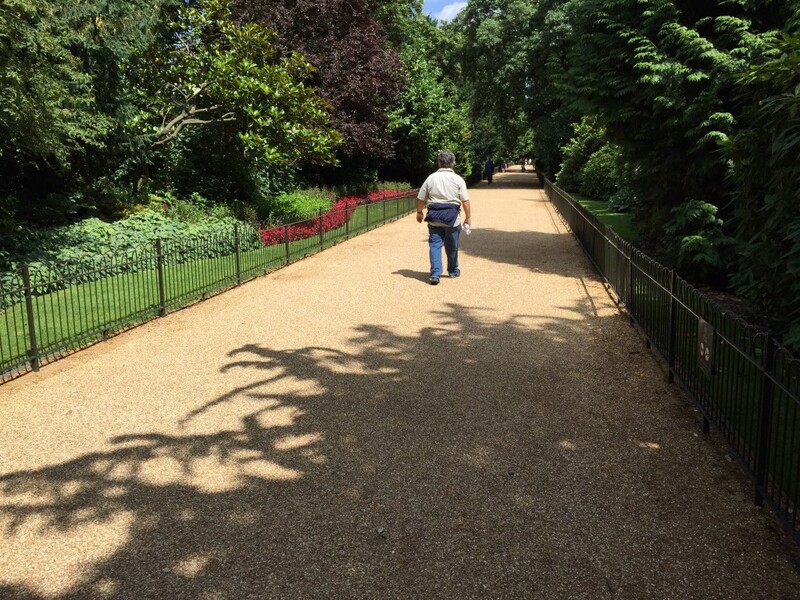 From there we walked though the Kensington Gardens and Hyde Park. 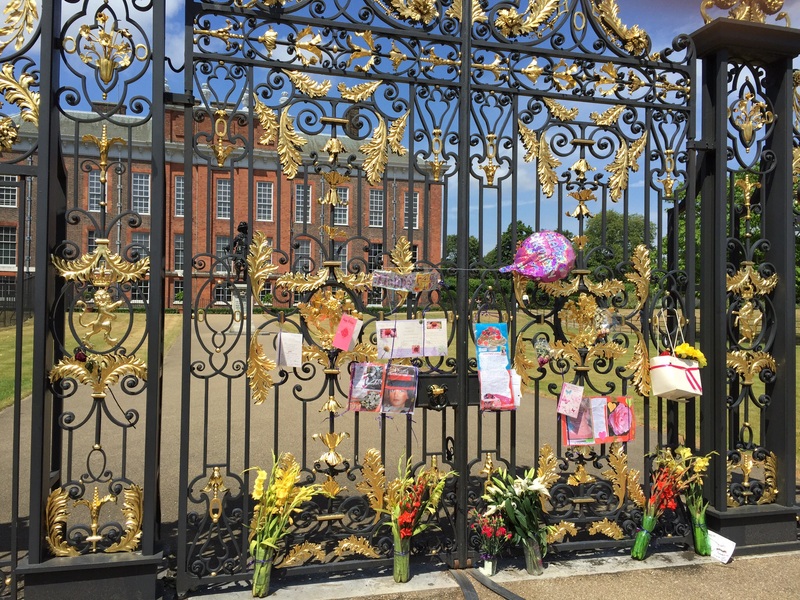 One of the gates on the side of Kensington Palace , the former home of Diana, Princess of Wales, has become a shrine to her. There were flowers and birthday cards wishing her a happy 54th. Much of the park looked brown and not very attractive, but we found some lovely walking paths. 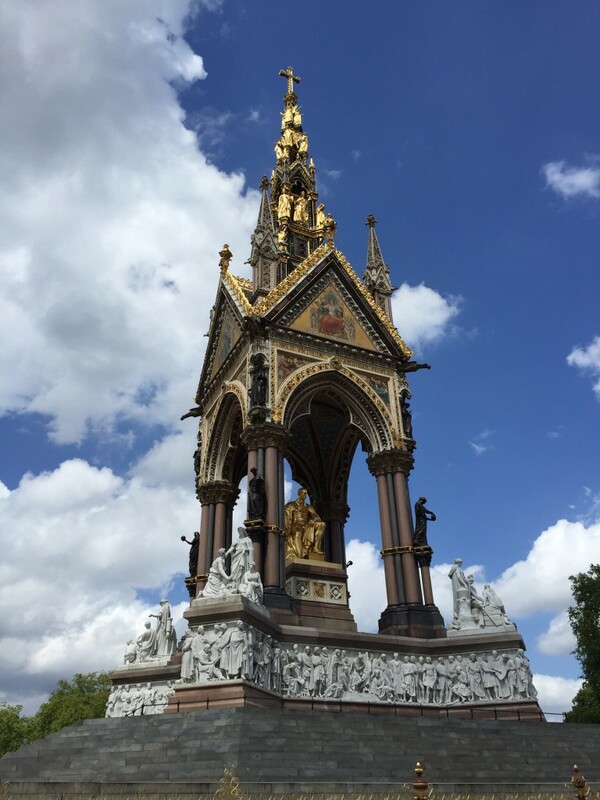 On our walk to the Victoria and Albert museum, we came upon this magnificent memorial to Prince Albert, husband of Queen Victoria. I especially enjoyed seeing it because Albert is a family name for my brother, father, grandfather, and many generations before them. After the Victoria and Albert Museum, we explored the area around the Tower of London. We walked by 10 Downing Street, the home of the Prime Minister, but a closed gate and guards prevented people from getting too close. 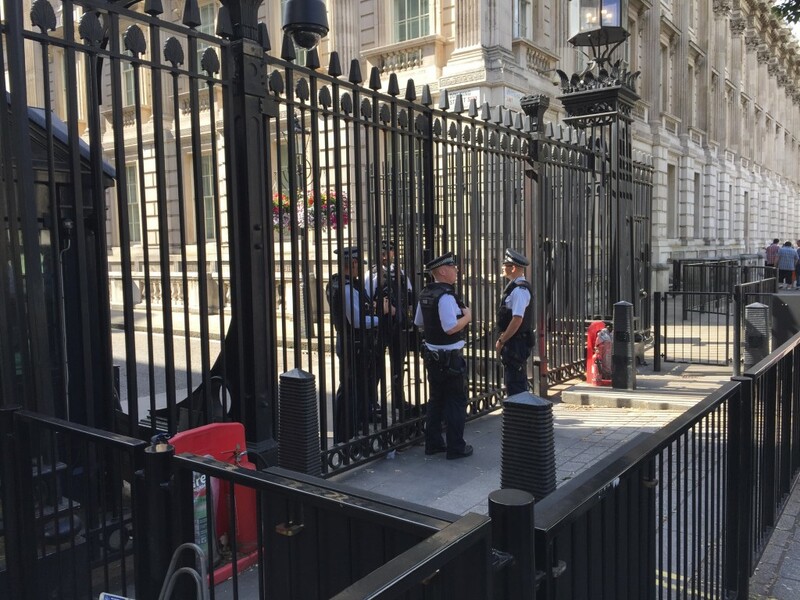 Right across the street from the entrance to 10 Downing Street is a fenced area that must be set aside for protesters. 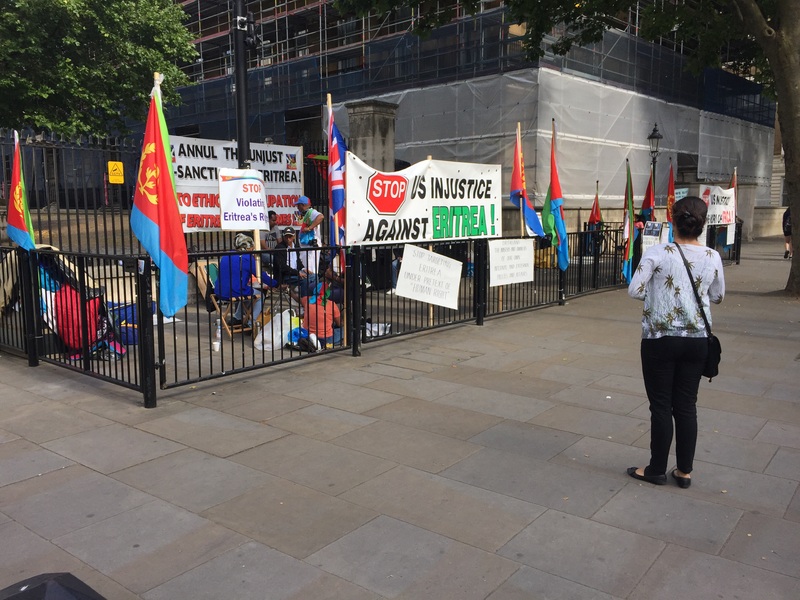 Today it was occupied by people protesting actions in Eritrea. We ended our day with a beautiful organ recital at Westminster Abbey. After the concert we walked part of the way back to our apartment through St. James Park and saw Duck Island Cottage, the beautiful Swiss chalet that was built as the home for the bird keeper in St. James Park. Taking the Tube for the final part of our trip home, I had a sobering moment when a young woman offered me her seat on the Tube. That was a first. A good dinner and a good night’s sleep, and we will be ready for our final day in London tomorrow. This entry was posted in Great Britain 2015 on July 5, 2015 by debbie. 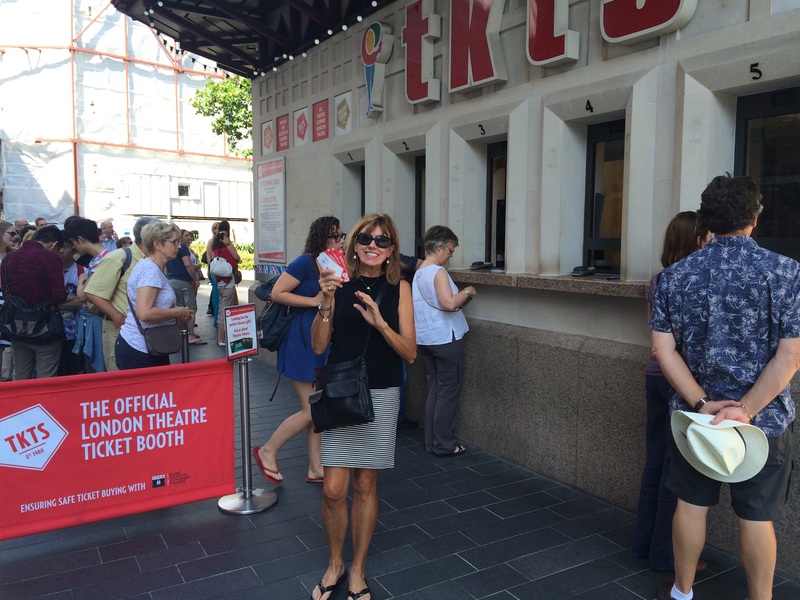 Our first stop today was Leicester Square to get play tickets at the tkts booth. We booked our Lion King tickets before we left the US and decided to wait until we got to London for other theatre tickets. The Official London Theatre Ticket Booth is a good resource for discounted and no-fee-added tickets. We got lucky and got discounted tickets for Memphis on Monday night. We walked two blocks over from Leicester Square to the National Gallery. One of Europe’s great galleries, the London museum houses displays of European paintings from 1250 to 1900. Our museum guide was amazing. 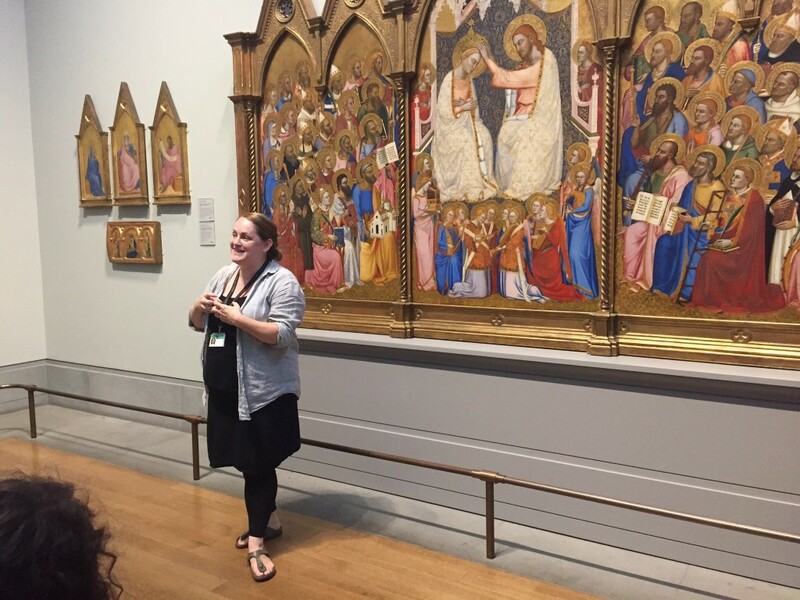 She especially helped us better understand and appreciate the paintings from the 1300s. In the afternoon we visited the Bank Museum. As part of the London Festival, the museum had special tours and hours today. We capped off our lovely day with a great performance of the Lion King at the Lyceum Theatre. Dining after the play, we met a couple from Minnesota on their honeymoon. Then it was home to our apartment before the tube quit running at midnight. 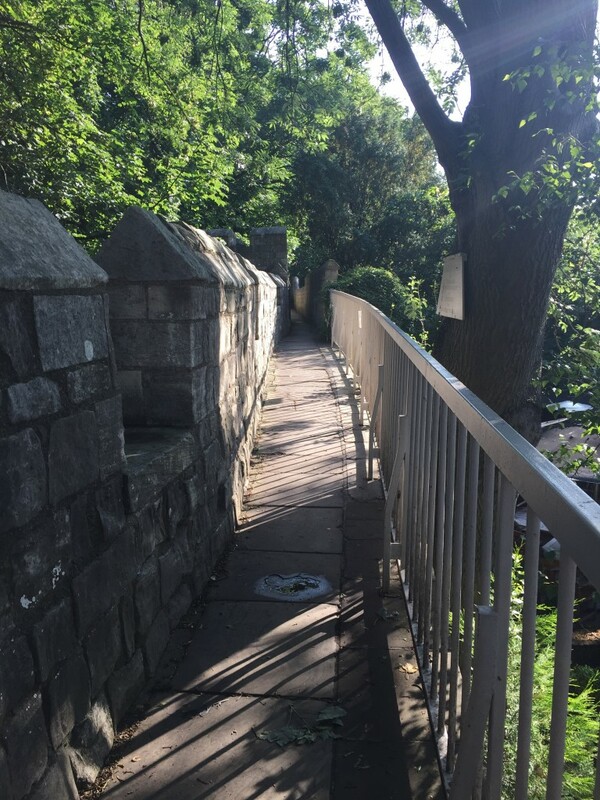 This entry was posted in Great Britain 2015 on July 4, 2015 by debbie. After a last-minute flight cancellation and a great deal of time on the phone with Delta, we arrived in London this morning-thirty minutes earlier than our cancelled flight would have arrived. London welcomed us with sunny skies and temps in the low 80s, not the London weather I remembered. The weather was not the only thing different from my memory. The skyline was different-more modern buildings with lots of curved and slanted edges and cranes everywhere. London is in the midst of a building boom. Our cab driver explained to us that foreign investors think London is a safe place for their money, and they are the ones responsible for most of the new building. London skyline view across the River Thames and Mellenium Bridge for the Tate Modern balcony. 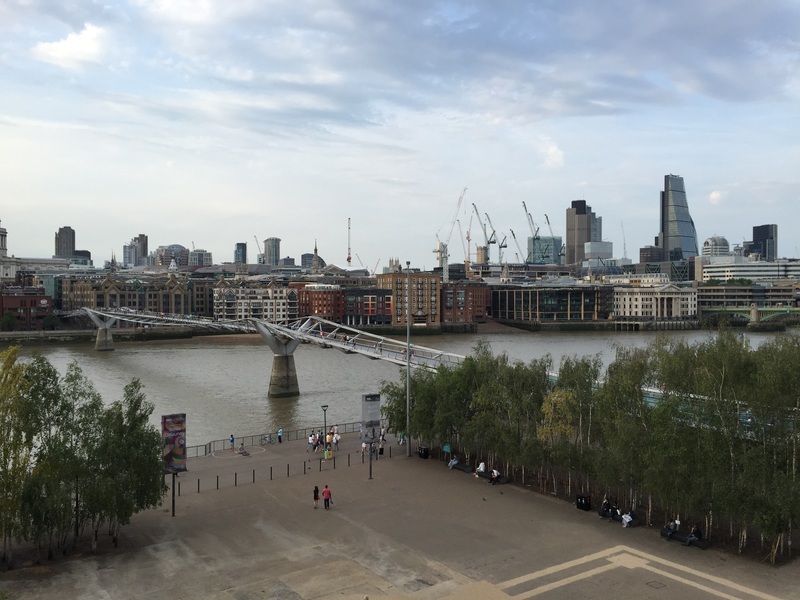 We explored our neighborhood a bit, then visited the Tate Modern. The Tate Modern is a huge museum housed in a converted powerhouse on the River Thames. Arranged by theme, not artist or period, each piece of art had helpful information about its artistic significance and contribution to the theme. Paul and I came pretty close to that delicate balance where we are in an art museum long enough for me and not too long for him. Crossing the Thames on the Mellenium Bridge, we could see Londoners strolling on both sides of the river, enjoying the beautiful weather. The Mellenium Bridge, the first bridge built in London in over a century, shook when people first crossed it. The city closed the pedestrian bridge, spent eight million dollars repairing it and re-opened it twenty months later. We walked back to our apartment via the Jubilee Walkway along the Thames and had a wonderful Indian dinner. London has great ethnic restaurants, and we plan to enjoy many different types of cuisine. More than twenty years ago, husband Paul, 10-year-old daughter Samantha and I embarked on our first European vacation. 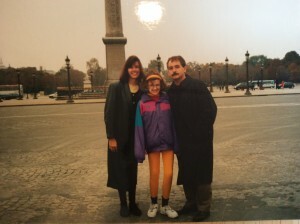 When we got married Paul promised me we would go to France within five years, and the deadline was approaching. 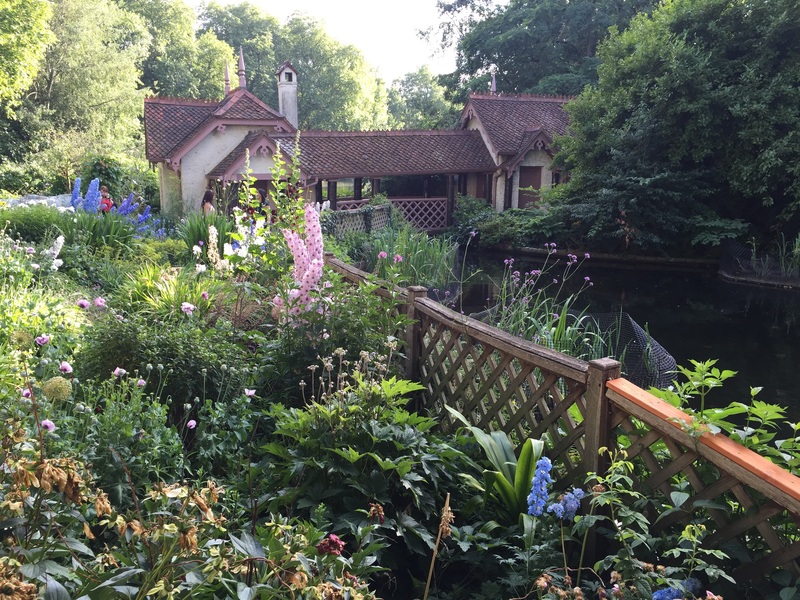 We decided to spend five days in England before crossing the English Channel to France to ease our way into visiting a different country with a different language. Paul likes to say he went on this first trip kicking and screaming but then realized how much he loved traveling. Many years and countries later, today we are excited to return to where our love of travel began. 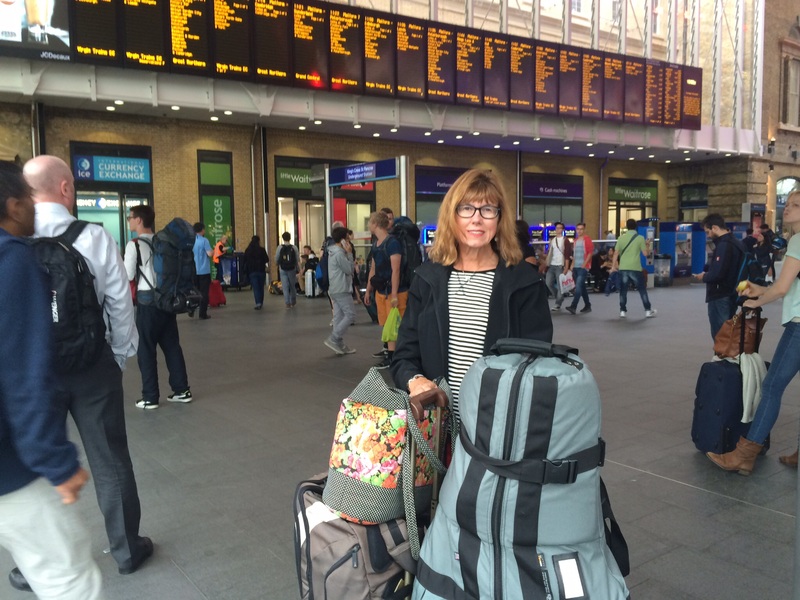 This entry was posted in Great Britain 2015 on July 2, 2015 by debbie.